TC Mag reports Intel has released 16 new 32nm processors, including Core, Pentium and Celeron branded chips. 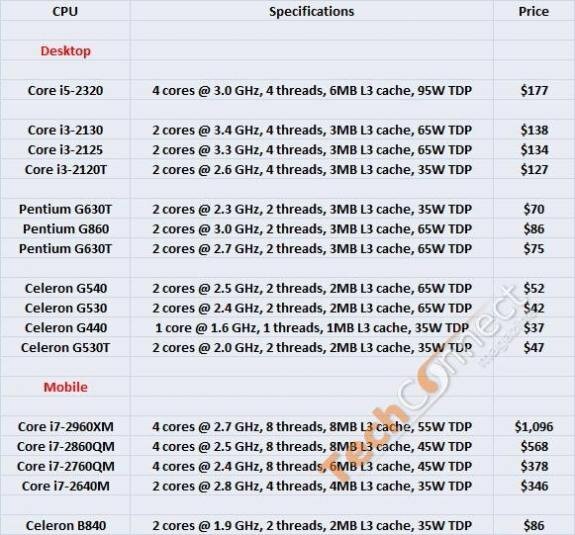 As seen in the tablet below, Intel released eleven desktop chips, the 'highest-end' being the 3.0 GHz Core i5-2320, and five mobile CPUs, including the new flagship that is the 2.7 GHz Core i72960XM. Prices go from $1,096 down to $47 so there's something for everyone. Everyone not waiting for AMD's FX-Series line, of course.